Following an enthralling trophy win against Fleetwood Town, Chesterfield prepare to do battle with another one of their promotion rivals. Spireites travel to Glanford Park tomorrow to take on a Scunthorpe United side unbeaten in their last 13 games in a top of the table clash. Paul Cook’s Chesterfield will be full of confidence after recording three consecutive wins in the league, which was stretched to four in all competitions after Tuesday night’s success in the JPT. But it will be a difficult task for the much-fancied table-topping team who will go up against an Iron side, who have hit a rich vein of form themselves. Scunthorpe manager Russ Wilcox has made a remarkable start to his management career since he took over following Brian Laws’departure in November. Wilcox guided the club from lingering outside the play-off picture into the automatic shake-up with four wins and a draw in his first five games. The Iron’s hierarchy then rewarded him with the job on a permanent basis and he has inspired an unbeaten run to fire the club within touching distance of Chesterfield at the top. They have stumbled of late, however, having been held in their last four games in the league, which has included three goalless draws and a 3-3 at Dagenham and Redbridge. They survived a late scare on Saturday as Hartlepool United piled on the pressure, but Wilcox’s side came away with a point. Despite a season of upheaval, Scunthorpe supporters remain confident of making a swift return to League One at the first attempt following relegation in May. 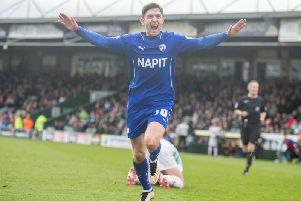 Jimmy Ryan, who was part of Laws’ side, left in the summer and joined Chesterfield whereas Gary McSheffrey made the reverse journey in January when he joined the Iron following a short spell with Spireites. Wilcox and Cook were both shortlisted for the League Two Manager of the Month accolade for January. They were up against Fleetwood’s Graham Alexander and Southend United’s Phil Brown. The winner will be announced today.